bNeurosurgical Service (A.A.D., K.P., J.M.M., A.J.T. ), Beth Israel Deaconess Medical Center, Harvard Medical School, Boston, MassachusettscNeuroSpine Surgery Research Group (K.P. ), Prince of Wales Private Hospital, Sydney, Australia. SUMMARY: Uptake of flow-diverting technology is rapidly outpacing the availability of clinical evidence. Most current usage is off-label, and the endovascular community is nearer the beginning than the end of the learning curve, given the number of devices in development. A comprehensive overview of technical specifications alongside key outcome data is essential both for clinical decision-making and to direct further investigations. Most-studied has been the Pipeline Embolization Device, which has undergone a transition to the Pipeline Flex for which outcome data are sparse or heterogeneous. Alternative endoluminal devices do not appear to be outperforming the Pipeline Embolization Device to date, though prospective studies and long-term data mostly are lacking, and between-study comparisons must be treated with caution. Nominal technical specifications may be unrelated to in situ performance, emphasizing the importance of correct radiologic sizing and device placement. Devices designed specifically for bifurcation aneurysms also lack long-term outcome data or have only recently become available for clinical use. There are no major studies directly comparing a flow-diverting device with standard coiling or microsurgical clipping. Data on flow-diverting stents are too limited in terms of long-term outcomes to reliably inform clinical decision-making. The best available evidence supports using a single endoluminal device for most indications. Recommendations on the suitability and choice of a device for bifurcation or ruptured aneurysms or for anatomically complex lesions cannot be made on the basis of current evidence. The appropriateness of flow-diverting treatment must be decided on a case-by-case basis, considering experience and the relative risks against standard approaches or observation. The Pipeline Embolization Device (PED; Covidien, Irvine, California) was approved by the FDA in 2011 and by the European Medicines Agency (EMA) in 2008 for the treatment of large or giant, wide-neck intracranial aneurysms of the internal carotid artery from the petrous to the superior hypophyseal segments.1 Currently, this is the only device approved in the United States. In Europe, there are additional options, including the PED, Silk flow diverter (Balt Extrusion, Montmorency, France), Flow-Redirection Endoluminal Device (FRED; MicroVention, Tustin, California), p64 (phenox, Bochum, Germany), Surpass Streamline (Stryker Neurovascular, Kalamazoo, Michigan), and Derivo (Acandis, Pforzheim, Germany). Multiple other endovascular flow diverters are commercially available or in late-stage development, including the endovascular devices Pipeline Flex and Pipeline Shield (Covidien), Tubridge (MicroPort Medical Company, Shanghai, China), and the Endovascular Clip System (eCLIPs; Evasc, Vancouver, Canada). No flow-diverting stent has been approved for use in the posterior circulation, treatment of aneurysmal subarachnoid hemorrhage, or in the anterior circulation beyond the internal carotid artery superior hypophyseal segment.2 The term “flow diverter” is arguably a misnomer because it is endothelialization that eventually sequestrates the aneurysm. Flow-diversion technology has relatively few studies reporting long-term outcomes, though available data suggest that complications beyond 6 months postprocedure are rare. Meanwhile, device technology is evolving rapidly, encompassing advances in the control and precision of device placement as well as growing operator experience and skill, all contributing to greater procedural safety.1 As a result, off-label humanitarian usage is increasing well ahead of long-term outcome data or regulatory approval. Challenging indications such as distal anterior or vertebrobasilar aneurysms are increasingly considered for flow diversion, against a backdrop of sparse clinical evidence and few guidelines, which make recommendations only for licensed indications.3 For some rarer types of aneurysms, obtaining clinical evidence from prospective trials is not feasible. Thus, operators are reliant mostly on empiric medicine. 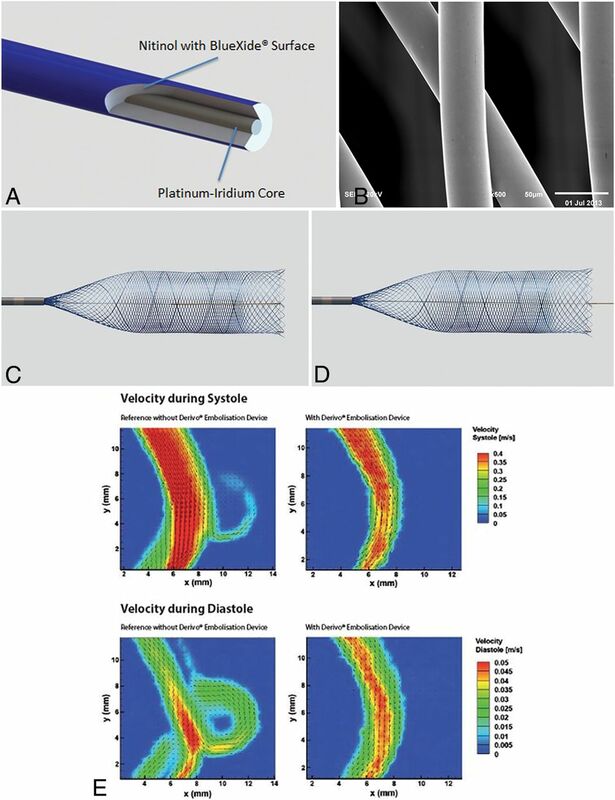 To our knowledge, this represents the most comprehensive review of technical specifications and representative outcome data for flow-diverting stents to inform this fast-moving field. Magnified (A) and flexed (B) views of the Pipeline Embolization Device classic cobalt chromium and platinum tungsten composition. C and D, Deployment views of the Pipeline Flex model with a detailed assembly schematic (E). Courtesy of Medtronic/Covidien, Irvine, CA. 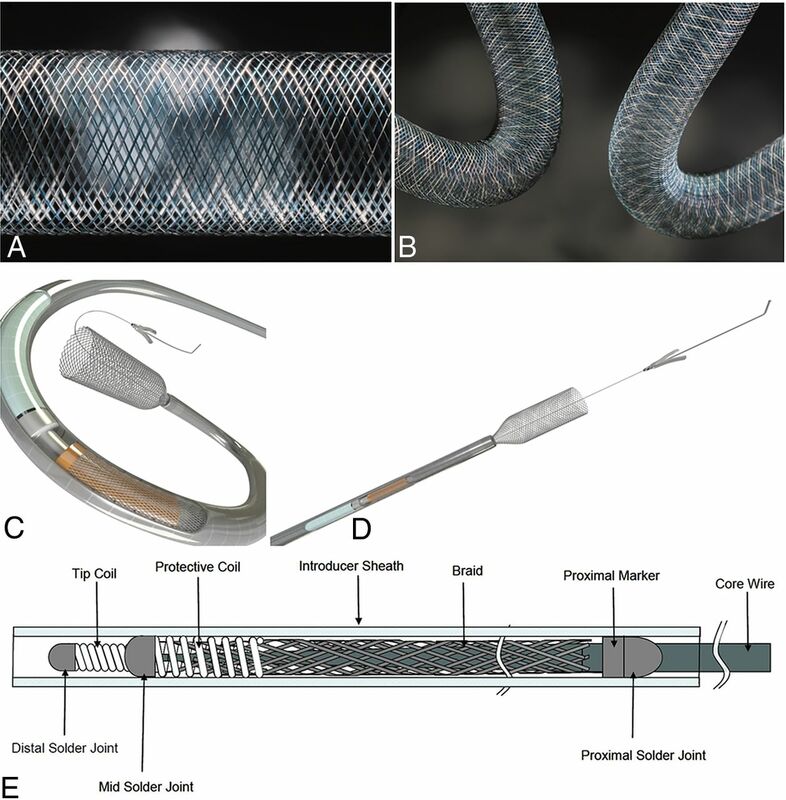 The next conventional braided mesh device to debut was the original Silk device, also a flexible mesh stent made from 48 braided nitinol and 4 platinum microfilaments, which was approved in Europe in 2008—the first such device to enter clinical use for intracranial aneurysm management.40,41 The platinum strands with 2 flared ends act as radiopaque markers. A new-generation Silk+ device has flared ends, lower porosity, higher radial force, greater slide capacity, an extrasupple and shorter (9 mm) distal radiopaque tip, and 8 platinum markers (Fig 2).42 Like its predecessor, the Silk+ device requires a smaller delivery microcatheter than other similar endovascular devices, 0.023 inches, though like others, it uses a 6F or 7F guide catheter.4 Tapered options are available for use in irregular anatomies. A, Silk+ assembly schematic with the placement system and pusher. The mono- (B) and bidiameter (C) Silk+ model as well as illustration of the position and deployment of the stent and radiopaque markers (D). Courtesy of Balt Extrusion, Montmorency, France. Of note is the observation from in vitro modeling studies that the MCR for the original Silk device had been reported as only 21% when stent and vessel were matched in a straight model segment versus a nominal MCR of 40%–55% (On-line Table 1).43 The MCR was decreased at oversizing (for straight segments and on the convexity of a curved segment) and for matched stent and segment diameters on the concavity because of dynamic wire repositioning. These results are clinically relevant because of the requirement to maximize and minimize the MCR across the aneurysm ostium and branch vessel orifice, respectively. The original device was withdrawn from the market. Regarding the Silk+, evidence is lacking. One small retrospective study of 58 patients with 70 aneurysms (including patients with prior or current SAH) compared outcomes for patients who received the original Silk device with those treated with Silk+ during nearly 1 year. Most patients did not undergo concomitant coiling. Delayed thromboembolic complications were seen in 10.6% of patients, and permanent neurologic morbidity, in 5.5%, all cases occurring in patients treated with the first-generation device; there was no procedure-related mortality. The overall occlusion rate across both devices was 73%, and there were no recanalizations.44 It can be inferred, albeit tentatively, that the second-generation Silk+ is safer than its predecessor, but more studies and data are needed to make definitive conclusions. Data from studies evaluating the FRED are still relatively sparse, with the European Multicenter Study for the Evaluation of a Dual-Layer Flow-Diverting Stent for Treatment of Wide-Neck Intracranial Aneurysms study representing the only large multicenter study (On-line Table 2).57 In several small studies, including studies that included patients with complex aneurysm morphologies, the FRED appeared to benchmark similar to the PED and better than the Silk (especially in terms of safety).40,55,58⇓–60 As mentioned previously, however, cross-study comparisons must be interpreted with caution. The FRED has been approved and has been available in Europe for several years and is in late-stage evaluation in a Phase III multicenter US trial in patients with wide-neck aneurysms of the ICA (Pivotal Study of the FRED Stent System in the Treatment of Intracranial Aneurysms; NCT01801007). The FRED offers higher radial force and, in our experience, excellent performance in paraclinoid aneurysms. The device may twist, and we have noted occasional unexplained acute or subacute thrombosis unrelated to antiaggregation activity. A smaller form factor, Fred Jr, may be used in bifurcation aneurysms and in aneurysms on small-sized vessels. A, Surpass deployment system schematic. B, By increasing the number of wires while decreasing the size of the wire, the Surpass stent hypothetically creates more flow diversion while maintaining a consistent porosity. C, Computational flow dynamics shows the relationship between porosity and pore attenuation and how porosity may be maintained while increasing pore attenuation. Courtesy of Stryker Neurovascular, Kalamazoo, MI. The other unique attribute of the Surpass is that it is an over-the-wire system, with the stent preloaded at the tip of the catheter. The system was designed this way to maintain wire access in case the stent needed to be re-crossed postdeployment, an advantage the Pipeline Flex also offers. The other benefit is the stability an over-the-wire system provides during stent deployment, even for long lengths. The downside is that the system is larger in nature, with a delivery microcatheter with a 0.040-inch inner diameter.61 Clinical data are limited but outcomes are predictable. For less challenging indications, occlusion rates and complications were favorable, while for more high-risk presentations, occlusion rates were lower and mortality was high (On-line Table 2).62,63 The Surpass is under evaluation for FDA approval in the Surpass Intracranial Aneurysm Embolization System Pivotal Trial to Treat Large or Giant Wide Neck Aneurysms (SCENT; NCT01716117), which reached primary end point completion in July 2017. The Surpass Flow Diverter for Intracranial Aneurysms (SURMOUNT registry; https://www.centerwatch.com/clinical-trials/listings/66634/cerebral-aneurysm-surpass-flow-diverter-intracranial/), a prospective multicenter postmarket surveillance study in Europe, is ongoing. This self-expandable stent mounted into the delivery catheter comprises up to 96 wires, thus providing more coverage. The Surpass is comparatively stiff and may be best navigated over a 5F distal access catheter across the aneurysm neck. By comparison, the Derivo comprises 48 braiding nitinol wires with a radiopaque platinum core (Fig 4), which has undergone laboratory testing including particle image velocimetry. The device has flared ends with the goal of improved apposition. Only very preliminary data are available from 1 small study, which showed improving occlusion rates with time and no obvious safety flags (On-line Table 2).67 The Derivo, Silk, and PED have undergone same-parameter particle imaging velocimetry testing showing that for all 3, the inflow-outflow is reversed from the proximal-to-distal aneurysm neck, after which a low-flow eddy predominates. There was a slightly higher susceptibility to inflow waveform/transient backflow with the Silk only.68 In our experience, the device is useful for supraclinoid aneurysms, and its latest iteration is similar in characteristics to the p64. A, Unconstrainted view of the Derivo Embolization Device (A) and magnified view of the BlueXide (B) surface of the Derivo Embolization Device acquired with a scanning electron microscope. The Derivo has closed, flared ends and may be used without a tip for increased flexibility (C) and with a tip for distal support and retention after release (D). E, Particle image velocimetry demonstrates effective flow diversion in an in vitro setting. Courtesy of Department of Cardiovascular Engineering, RWTH Aachen University in Aachen, North Rhine-Westphalia, Germany. Finally, the p64 device is a flexible, meshlike tube of 64 interwoven nitinol microfilaments grouped into 8 proximal radiopaque bundle markers, deployed using an 0.027-inch microcatheter. The p64 is completely recoverable—even after complete deployment—because of its controlled mechanical detachment (On-line Table 1).4,54 Data are limited, but several retrospective studies have shown midterm occlusion rates of at least 85% with low morbidity/mortality (On-line Table 2).11,69,70 As with all new devices, there will be a learning curve to consider. For noncontrolled descriptive studies, there is the potential for publication bias with this and all subsequent devices discussed herein. In our experience, this nitinol device is best used on small-neck or smaller overall aneurysms. The p64 does not have a distal wire for support, which may be an issue for telescoping or overly wide-neck aneurysms. The device is fully recoverable after full deployment; however, some proximal opening issues have occurred. 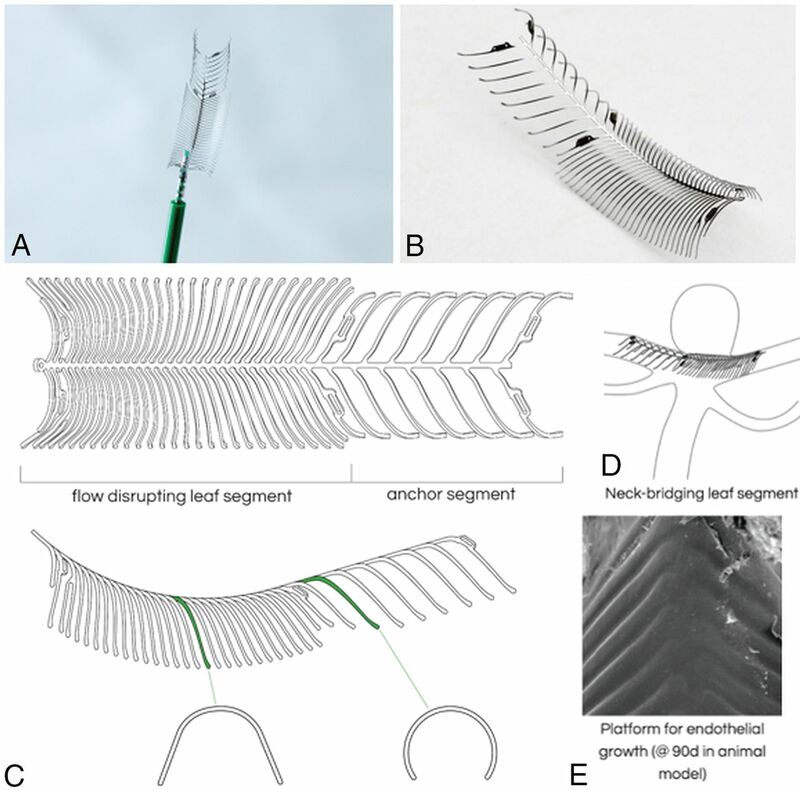 The second-generation eCLIPs is a novel, self-expanding, nitinol, non-circumferential, hybrid device with flow diverter properties, specifically designed for bifurcation aneurysms (Fig 5 and On-line Table 1). It has platinum radiopaque markers and comprises two discrete sections: an anchor segment designed to conform to vessel walls beside the aneurysm ostium, and a leaf segment with flow-diverter properties which has moveable ribs to allow trans-device coil delivery. 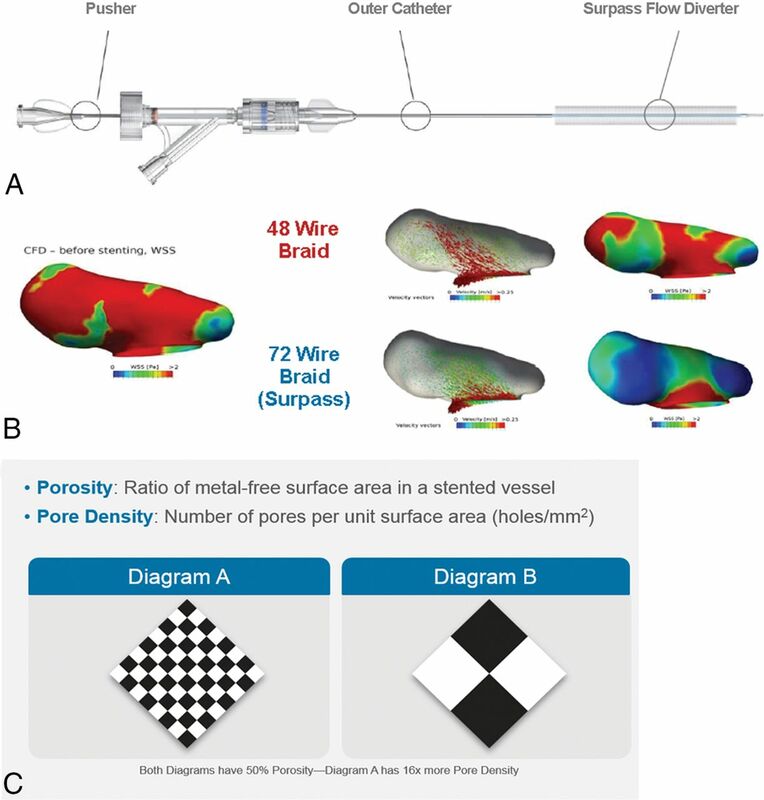 Data from numerous challenging presentations are shown in On-line Table 2.71 eCLIPs is potentially unique as it is the only device to date which shows endothelialization as a bifurcation hybrid device. The European eCLIPs Safety, Feasibility an Efficacy Study (EESIS) is a prospective, multicenter cohort/registry study which is ongoing. The bifurcation device eCLIPs (A) with a self-aligning spine rib design (B) having flow-disrupting and anchor segments (C) to enable repositioning but no migration/shortening following deployment. D, Noncircumferential morphology designed for wall apposition, which does not reside in the parent vessel or impede side branches. E, Scanning electron micrograph demonstrates neoendothelialization in vivo. Courtesy of the CV Path Institute, Gaithersburg, Maryland. A, Sphere device with a high-attenuation nitinol face within a bifurcation aneurysm with thin-wire anchor legs (B) designed to direct flow downstream. C, Computational flow dynamics study demonstrates decreased peak flow reduction to the aneurysm sac as well as velocity and wall shear stress (D), which is superior in Sphere compared to conventional endoluminal devices in some aneurysm/branch vessel morphologies in animal models. Courtesy of the Weill Cornell School of Medicine, New York, New York. For many types of aneurysms, flow diversion has rapidly become the treatment of choice because cure rates are high and complications rates are reasonably low. Unlike traditional stents, which require a high radial opening force, flow-diverting stents are designed to have a low radial opening force to facilitate navigability. 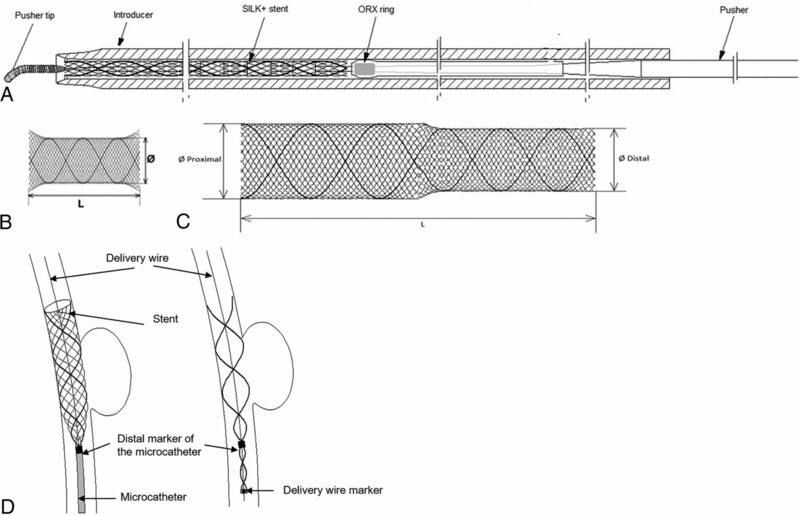 Moreover, flow-diverting stents require greater metal coverage and decreased porosity while maintaining pore attenuation; this has been achieved using a braided metallic design for many devices. Early preclinical experiments suggested that the optimal porosity for aneurysm occlusion is 70%, but this may vary in practice according to vessel configuration and device sizing. Oversizing generally should be avoided, and the number of devices used per aneurysm should be minimized to reduce the risk of complications. There are too few data to make definitive recommendations on the choice of a device for bifurcation or ruptured aneurysms. There are minimal data on the PED Flex alone; however, given that the device is similar to its forerunner, we may reasonably expect at least equivalent outcomes, possibly with improved procedural performance. Two devices could be approved in the United States within the next 2 years (the FRED and Surpass). Limited data likely reflect a learning curve for some devices, and outcomes should improve with experience. Further studies are needed to relate technical specifications to device performance and outcomes and hence optimize usage, particularly for the most challenging aneurysm presentations. Disclosures: Vitor Mendes Pereira—RELATED: Consulting Fee or Honorarium: Medtronic, Stryker, Balt, Cerenovous, Comments: participating in studies or proctoring. * Ajith J. Thomas—RELATED: Fees for Participation in Review Activities Such as Data Monitoring Boards, Statistical Analysis, Endpoint Committees, and the Like: Stryker, Comments: Data Safety Monitoring Board for the SCENT trial*; UNRELATED: Expert Testimony: CRICO, Comments: brain aneurysm treatment. *Money paid to the institution. Accepted after revision January 25, 2019.